Pictured from the left, Dr. Teresa Carmichael, Lori Moran, Dr. Pat Halbur and Dr. Kristen Obbink. 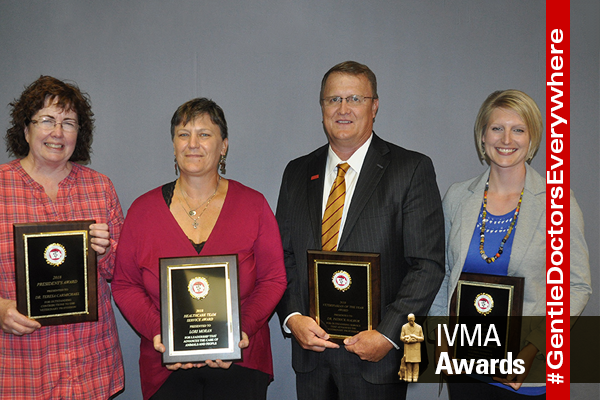 Individuals with connections to the College of Veterinary Medicine won all four of the awards recently handed out by the Iowa Veterinary Medical Association. Dr. Pat Halbur (’86), the Dr. Stephen G. Juelsgaard Interim Dean of Veterinary Medicine, was named the Veterinarian of the Year. Other recipients included Dr. Teresa Carmichael (’90), Mahaska Veterinary Clinic, President’s Award; Dr. Kristen Obbink (2011), veterinary specialist with the Center for Food Security and Public Health, Rising Star Award; and Lori Moran, veterinary technician at the Lloyd Veterinary Medical Center, the Healthcare Team Member Service Award. Halbur and Dr. Roy Schultz (’60) of Avoca, Iowa, were both named recipients of the Outstanding Service Award from Iowa State’s Veterinary Medical Alumni Association.